I will be looking for correct CRV format first, accuracy second in the sessions. Go as far as you can in the CRV process. BUT TRY to spend 2 or more pages in stages 1 ideograms. BUT TRY to spend 3 or more pages in stages 3 sketching. Force yourself to look around, to feel around and provide me with MORE S3 pages - please. TRY to spend 3 or more pages in stages 4 . I will collect them all, write a few notes and when all gathered will put them online here - for us to discuss - so be prepared for your work being here - in public. The sessions have to be scanned-in and converted to pdf format. You all have to start to get into the process of treating and submitting work correctly - anything not done as scanned pages to pdf wont be reviewed. Scan you pages and compile as an optimized .pdf file. If you don't have .pdf there are many free tools online for doing this - a quick Google search will get you many. Save/scan the images at 150-300dpi black and white (this keeps the file size down). If you need help with this then email me. I would like a typed session summary as well for your session. the actual summary is the last page (14). Add the summary to the .pdf as well please. As well as helping with general RV/CRV - hopefully the mentoring and our work together will also help you with key skills to help present your RV data for future clients, projects and needs. Any questions then ask - email me at the address above. Don't forget have fun - its not a race - the key is to learn something! I look forward to working with you all. And above all have fun with this. Ok some questions got answered. it helps to read the whole thing. Thank you. OK. I think the above comments may put a nail in the coffin for the practice target session as it has muddied the waters and implanted unnecessary AOL influence. im guessing it was not deliberate just missguided. All information regarding an ongoing session must be kept private and even when session is completed, scanned, summurised and emailed to mentor for evaluation it should still not be discussed until feedback has been posted by the mentor and everyones session can then shown at same time. normaly some time after the due date. Yes, I agree with Gerry - AOL influence has been imparted and it is totally unfair to the participants doing the target. I will not even guess why Red Star has put his point of view across but if he wants to show that he has nailed the target, I would rather study his completed session when Daz gives his feedback. I'm not sure now whether my session will be spoilt or not as I have already done stages 1 and 2 and was taking a break when I read this. I have removed his posts- hes a stupid Idiot and what he said bears no relevance to this target. I am not trashing this target - YOU are REMOTE VIEWERS using CRV CONTROLLED REMOTE VIEWING - you can get past this. Just ignore it and move on. I apologise to daz and everyone if sticking my oar in has stirred the pot unnecessarily. to learn from it and as Daz says we can ignore it and move on. Yes, thanks Daz and Gerry, no bother. Dont worry about it peeps - these things happens in the real world, try to ignore the drama and to do your thing, tis good practice for those timers when you have to rv on a bus or at a desk or cafe with all the worlds distractions. Is there a dark narrow hallway kind of structure? great stuff and generally some very good target contact within - so WELL DONE ALL! The remote viewer is to move to the optimum position and location to describe the target in full detail only. thank you for participating. Let me know what you think of each others and your own work. Janine, your session was brilliant and you totally got the target - the sketches were amazing, the full image of the statue and the flowing garment. You even got the arm raised above the head, well done! Gerry, you got great data too, the face and the outline of the platform, very good. Well done to the newcomers and their good efforts. I was just looking over my earlier targets and when I started off with CRV, I was just submitting a few pages, having recently taken my first CRV course with Paul O'Connor in Ireland. Now with Daz's help, I am well onto stage 4 and getting to understand the structure much better, so really I have come a long way since starting off. On this target, I was just getting the correct data at stage 4 when I ended my session,so I have to take it further the next time. Looking forward to the next target and thanks to Daz for your kind help and perseverance. A warm welcome to the new people joining in doing practice sessions here. I agree with Jeane...I too feel that I have come a long way in the last couple of years by working practice sessions and getting counseling and feedback from Daz. 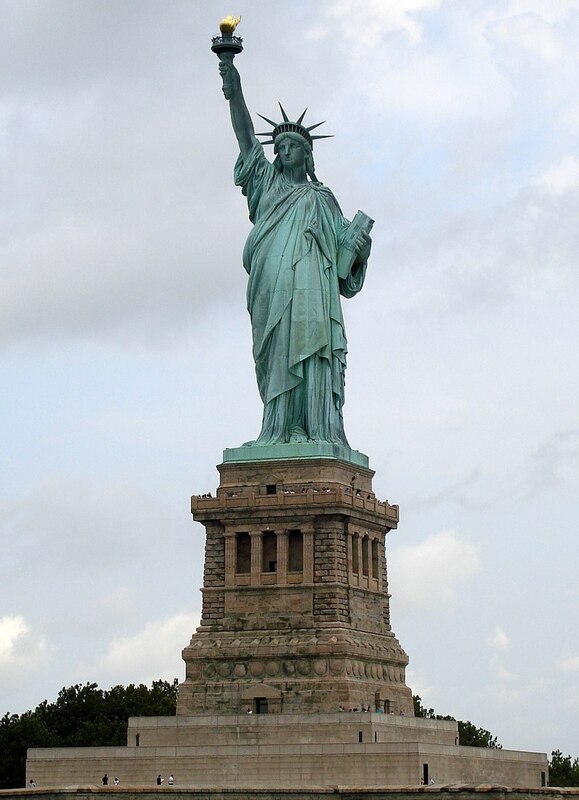 The first time I did a session on the Statue of Liberty, I'm not even sure that I reached the target. This provides an opportunity to learn and practice among others of like mind. I don't think there is a better deal anywhere...we need to practice...and we get feedback from someone with professional experience and inspiring reputation. Jeane...your session was awesome. Everything in it appeared to pertain directly to the target...with really excellent data for the location and bios in particular but the whole thing was great. Gerry... good to see you are back. :- ) You got good data in your session...the platform, public, display, life-forms gathered...I could totally see how it might seem like a political or campaign bio...being "larger than life" as it is. <G> And the starting and stopping--could that pertain to the people waiting in lines? Jetke had lots of good site data, not to mention getting the main gestalts right off the bat. Those window-like apertures look like they are from Lady Liberty's crown, but my favorite part of his session was the sketch of the energy movements---maybe from the boats around the island and the paths of the people moving on the island? And now I wonder if the statue is on an energy site on the earth grid? Cynthia got the vertical orientation, that the target is manmade and steel (metal)--even the color. Cath got some large circles... and water, too....I wonder if she could have been perceiving the islands from above?--she even got people looking up and shading their eyes, which I imagine is what everyone does when they see it. My compliments to everyone who participated. What an exciting adventure we're taking! And to have a master teaching us! There was some great data in the sessions - keep up the effort adn well done.